Although they can be difficult to find, frogfish are one of the best subjects for underwater photographers, especially beginners. They come in all different colors, all different sizes, and don’t like to move around that much. Sometimes they are so camouflaged or hidden that the resulting photograph is cluttered, boring, or makes it hard to even see where they are. Luckily, there are plenty of techniques when photographing them that allow for great, creative photos. One alternative frogfish shot is to show the entire fish with its lure out. This is good if you want him to fill the entire photo while highlighting the fact that it is fishing. 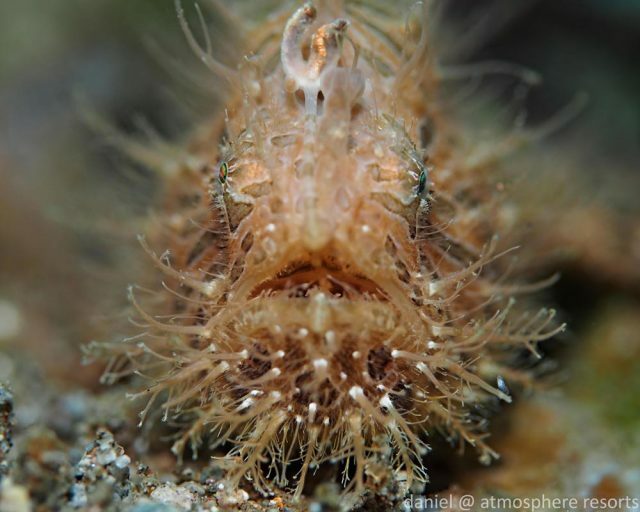 If you want to get creative, zoom in a bit and photograph the face and the lure or the lure on its own, especially when dealing with hairy frogfish as they have a huge worm-shaped lure. This option is good if you desire a macro or super macro shot and want the focus to be specifically the behavior and not the frogfish as a whole. Alternatively you can zoom out and include the fish and its potential prey to produce a wide angle behavior shot. Behavior shot focusing on the lure. Many frogfish are so well hidden that only their faces are visible. Not to worry, great photos are still possible. 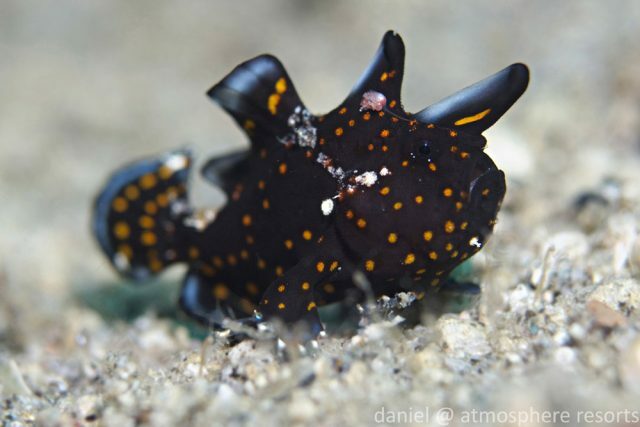 This is especially relevant if you find a giant frogfish while using a 60 or 105mm lens and it won’t fit in the frame. Shoot from the side while focusing the shot on the side of the face and, if possible, utilize some negative space behind the subject such as a blue or black background. When including only the side of the face in a photograph, the body pattern is highlighted as well as the upturned mouth and, if shooting from the correct side, the stationary lure. This angle occasionally makes the frogfish look quite scary which results in a cool photo. If you want to get creative, shoot at a shallow depth of field while focusing on the eye for a really soft, creative shot. Their face and background will be blurry except for a very sharp eye. 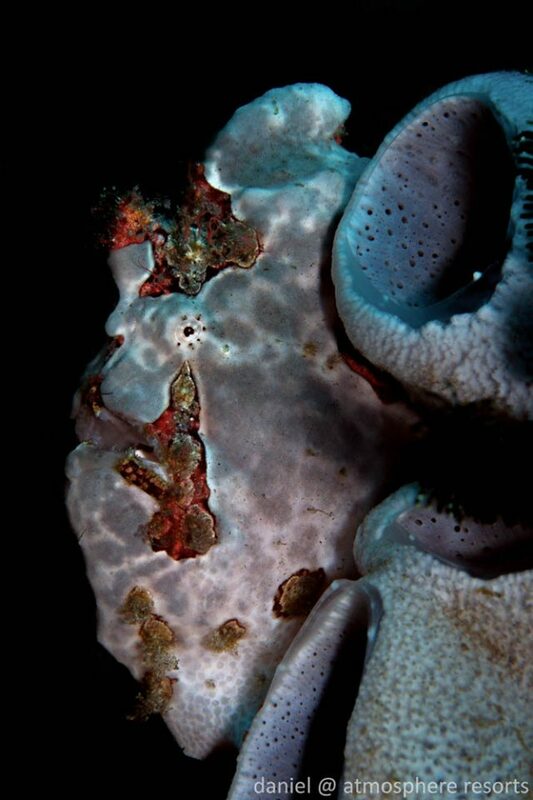 An alternative face photograph is shooting the frogfish directly from the front for a face portrait. This is a great idea when the body is located in or obstructed by an undesirable habitat. If the little guy is isolated in the sand or perched in between the arms of a branching sponge, this is one of the best alternatives as you can get an unobstructed view of the face with little or no distracting background. This technique also allows for creativity when it comes to experimenting with blurry backgrounds or blurry portions of the face. 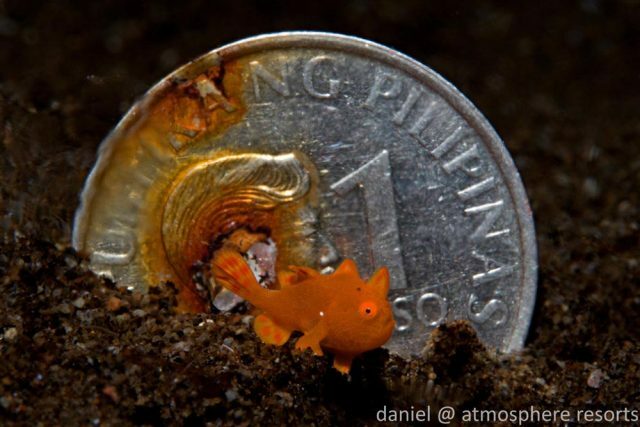 Occasionally, you will find a frogfish that is just too big or too small for your lens. No problem if you feel like getting creative. If he’s too big, focus on an interesting section of the body pattern and experiment with a little abstract photography. If he’s too small, include a size reference to take up some space in the photograph. A pointer stick or ruler are great options, as well as a finger. If you use a finger as a size reference make sure that either the nail is manicured or it is facing away from the camera. Otherwise it will just be a distraction. It is important to refrain from moving animals for a photograph, especially when it comes to frogfish. They have been known to be cannibals if another gets to close so never move two closer together. Their camouflage relies on their lack of movement which allows algae, coral polyps, and other organisms to grow and live on the their bodies. By moving frogfish, they are no longer camouflaged against their chosen habitats and this can even dislodge some of the organisms that have made a frogfish their home. 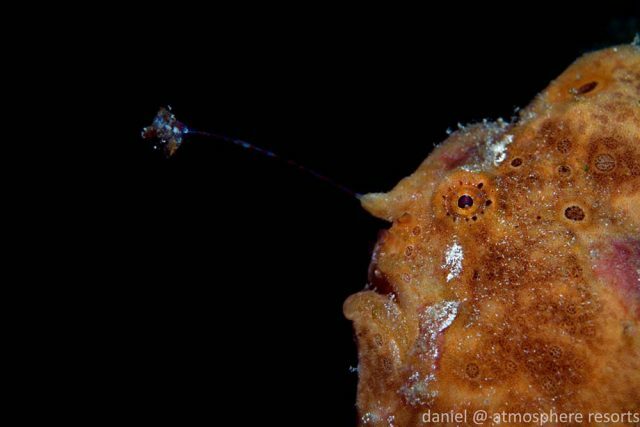 If you want to know more about photographing frogfish, you can read my whole article at Dive Photo Guide.